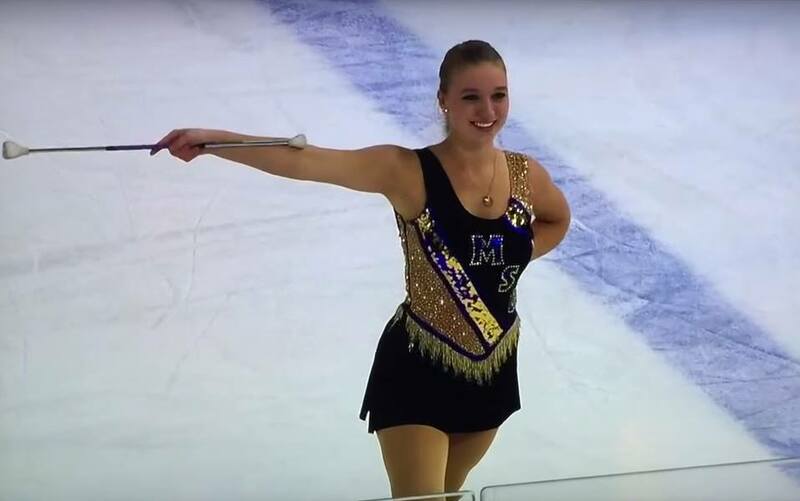 From a wedding-themed show where an actual wedding occurred, to twirling on ice... Nicole Nelson, the FIRST feature twirler for Minnesota State University, Mankato, is living out her dream everyday. She hosted the first "Twirler for a Day" and is teaching the next generation of college twirlers in Minnesota through her studio, Dance-Twirl Minnesota. 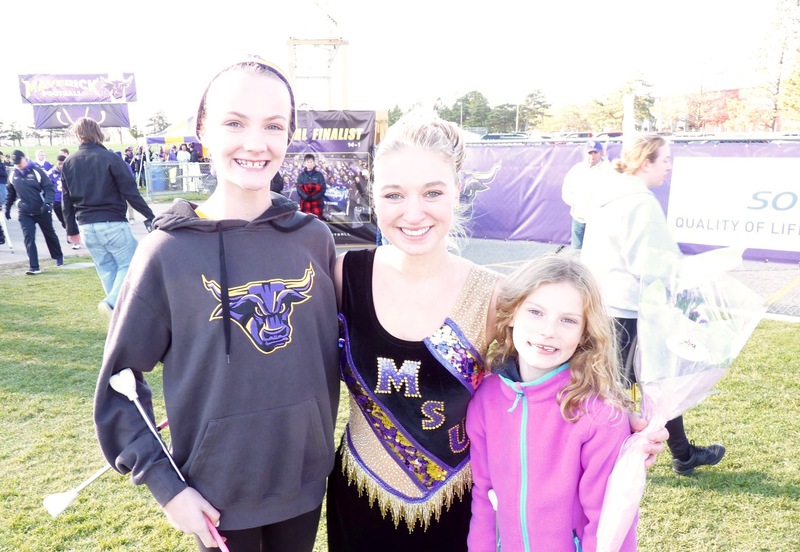 Read on to meet Nicole and hear about the impact she's making on the twirling world and with the Maverick Machine at Minnesota State University. NN: Hello! 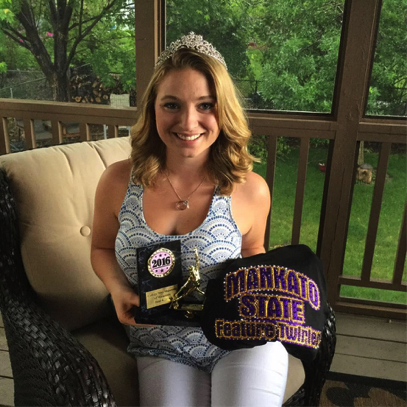 My name is Nicole Nelson, I am 21, and I am blessed to be the first Feature Twirler at Minnesota State University, Mankato in over 30 years. I grew up in Rosemount, MN and I am currently a Non-Traditional Senior at Minnesota State, where I am studying Elementary Education. CMB: How did you get into baton twirling? NN: Twirling has been in my life since I was 6 years old. I started twirling because I was incredibly shy and my mom wanted me to get involved with a sport. I picked baton twirling because it was different and honestly, I just wanted to stop looking at all the choices. My first few classes resulted in me mostly participating from my mother's lap, but eventually I was in the action with all my other future teammates. Soon, my classmates became my teammates, who then became my fellow National Champions, and some are now lifelong best friends. CMB: What are some of your twirling accomplishments? NN: I have had twirling in my life for 16 years. I have been able to be a part of opening a baton twirling and dance studio in Eagan, Minnesota with my longtime coach, Jacinda Miller. Dance-Twirl Minnesota has allowed me to combine my two favorite things; baton twirling and teaching. In 2010, I was captain of my team when we won our first National Championship at AYOP. I am humbled to be the current College Miss Majorette of Minnesota. Although my personal accomplishments are a highlight, my biggest accomplishments come from teaching my twirlers. It is the best thing ever to see their love of the sport blossom. My proudest moment was seeing my girls win the national title of the Juvenile Parade Corp National Champions and watch them, with tearful eyes, as they competed in the National Grand Team Corp Finals at AYOP. CMB: How did you get involved with twirling at Minnesota State University, Mankato? Did you twirl in High School? NN: In high school, I was never allowed to twirl with the band because the band wasn’t interested. This was hard to feel like my passion wasn’t worth being shown to the school. I decided to go to school at a local community college where I was able to teach at my studio, work my tail off, and pay my first two years completely out of pocket. When I was accepted to Minnesota State, I immediately emailed the band director, Michael Thursby, my twirling resume and asked if having a Feature Twirler would be something he would be interested in. I was overjoyed when I got an email back just a couple days later telling me he would love to have a twirler and to send in a video! The band at my school is rather new. It just started back up about 4 years ago. I am lucky to be apart of a growing band because you get to see all the amazing changes it is going through. Minnesota State’s motto is “Big Ideas” and that is exactly what my band director instills in us as a band. From having a full blown wedding show on the day of two band member's wedding on the field, to performing on ice at a hockey game, you never really know what is going to come next and I love that. 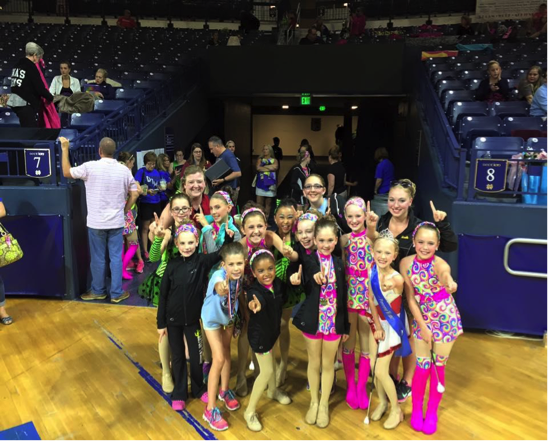 Why do you love twirling for your school? Our band's motto is, Family. Pride. Excellence. We bring that into everything we do. The band feels like a family and we take pride in what we do. I have always been prideful of my twirling and it’s so fun to be apart of a group that feels the same way about their passion. I love being able to be apart of such an great organization and being apart of the next Big Idea. CMB: What is your favorite memory twirling at your school so far? NN: That’s a hard one! There is so many great memories already! It would have to be either twirling at Youth In Music this past Fall at US Bank Stadium. Being out on the field in such a well known and massive stadium was surreal! Another great memory was when I was able to bring 20 of my twirlers to Minnesota State for the first annual Twirler For A Day event! It was so fun to share the field with them and get them excited about twirling in college! CMB: What is your biggest piece of advice for twirler? NN: Don’t give up. If you want to twirl for your school but your school doesn’t have a twirler. E-mail them. It can’t hurt and if they say no, find another way to share your passion. Even though my High School didn’t allow me to twirl, I have still been able to fulfill my dream of being a Feature Twirler and I couldn’t be happier. Twirling has been one of the biggest influences in my life and I cannot wait to continue to teach and give back to the sport that gave so much to me. This summer I will be performing with my girls out on the field at the OutBack Collegiate Bowl Game and will be returning next Fall for another amazing year with the Maverick Machine at Minnesota State University! GO MAVS!